Kronosaurus is extinct from about the Middle Turonian stage of the Late Cretaceous. The pliosaurs that remain are the smaller Dolichorhynchops. A branch of the monitor lizard family went to sea; their descendants are snakes. Mosasaurs were extremely successful, and may have contributed to the disappearance of the ichthyosaurs and the decline of the plesiosaurs. In the Late Cretaceous, the Western Interior Seaway reached as far north as the Arctic Sea and as far south as the Gulf of Mexico; completely dividing the eastern and western landmasses of what we now call North America. Generally shallow, the waterway is estimated to have been less than 600 feet deep, with a flat, muddy bottom. Turtles, fish, mosasaurs, plesiosaurs, and aquatic birds swam the shallow seas and invertebrates, such as crinoids, echinoids, crabs, lobsters, ammonites, snails and clams were common. Several sea going turtles existed in the Cretaceous. The giant sea turtle Archelon had a life style much like the present-day green back turtle. Archelon ischyros lived about 70 million years ago in the Mid-American Seaway, during the Cretaceous period. At least occasionally they were food for the giant Mosasasurus; fossils of Archelon with teeth marks that match the bite of mosasaurs have been found. The shell of this turtle was reduced to a framework of struts made from bony ribs that grew from the backbone. It had weak jaws, a toothless beak, and probably fed on jellyfish. Brachauchenius was one of the last of the pliosaurs. Ammonites are closely related to octopuses, squid, and cuttlefish. 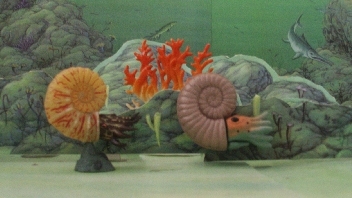 Ammonites, with their curled shells, and Belemnites were characteristic of the Late Cretaceous Seas, and their disappearance marks the end of the Mesozoic.